Made in USA by Huy Fong, this is a fairly mild chile sauce that comes off with a fresh wholesome flavor. Similar to sambal oelek, but with the addition of garlic, you can use it as a condiment or cook with it. 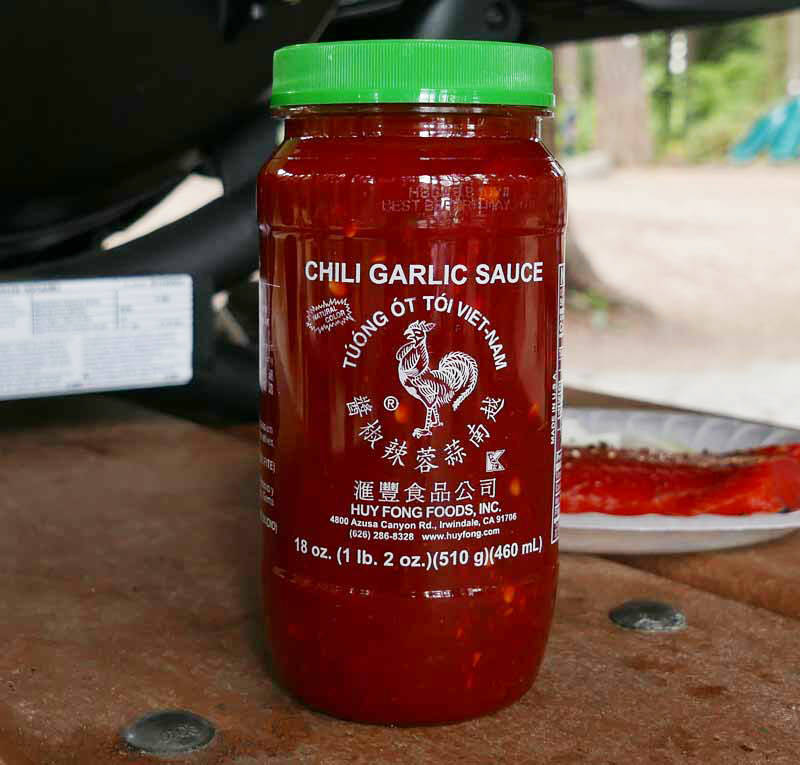 A tempting blend of coarsely ground chilies and garlic. The delicious flavor of the sauce complements everything from a cracker to poultry to soups. We've really been enjoying this lately with our new recipes: Pho and Ginger Seafood. Ingredients: chile, garlic, salt, distilled vinegar, potassium sorbate and sodium bisulfite as preservatives. If you'd like to make this at home from scratch, we've included a recipe below too. Make your own fresh Chili Garlic Sauce with this easy to use recipe. Shrimpcakes are often served in the more upscale Thai/Chinese restaurants in Thailand. We love the flavor of these shrimpcakes. The chile-lime sauce is definitely not a Thai flavor, but it's quite tasty. We think you would enjoy this dish just as much if the shrimpcakes are served with fresh yellow chile sauceand or Mae Ploy sweet chile sauce so the chile-lime sauce is optional. For best results use the largest, best quality shrimp you can find. The condiment caddy is found in nearly every restaurant in Thailand, and here we have for a reasonable price the finest quality set we could find. Known in Thai as a "Puang Prik", the caddy itself is made of stainless steel. Also stainless steel are the long spoons, perfectly shaped for scooping, and the lids that cover the glasses. You get four glasses, four lids, four spoons and the caddy itself. The capacity of each glass is 3/4 cup. The caddy is 6 inches tall, from base to the top of the handle (not too big, not too small). See below for more pictures and description. Our Thai condiment caddy, shown above, has four covered glasses each with a long spoon shaped just for the purpose of scooping out whatever's inside. Then, alongside those four, a separate small dish with fish sauce and sliced fresh chile. In American restaurants, the caddy is usually only brought out for diners upon request (for those "in the know") and what's inside is up to the restaurant. At right is the puang prik one of our local restaurants brought us, consisting of ground dried chile, sliced jalapeno in vinegar, sliced Thai chile in fish sauce, and chili garlic sauce.